(Al Hartmann | The Salt Lake Tribune) Chris Barlow, head distiller, and co-owner of Beehive Distilling is getting the new beautifull copper distiller up and running at their new location at 2245 S. West Temple. The small craft distillery that opened in 2013 producing Jack Rabbit Gin has grown since then, and recently moved to a new, 6,000-square-foot space that will allow it to increase production from the 80-gallons to more than 530 gallons. (Al Hartmann | The Salt Lake Tribune) The new 450-gallon copper still at Beehive Distilling's new Salt Lake City location at 2245 S. West Temple. Beehive will continue to make its signature Jack Rabbit gin, but the larger still means it can start producing whiskey and other spirits. (Al Hartmann | The Salt Lake Tribune) Matt Aller, left, Chris Barlow, and Erik Ostling, co-owners of Beehive Distilling sample Barrel Reserve Gin at their new Salt Lake City location, 2245 S. West Temple. The new 450-gallon copper still in the background will allow for increased production. 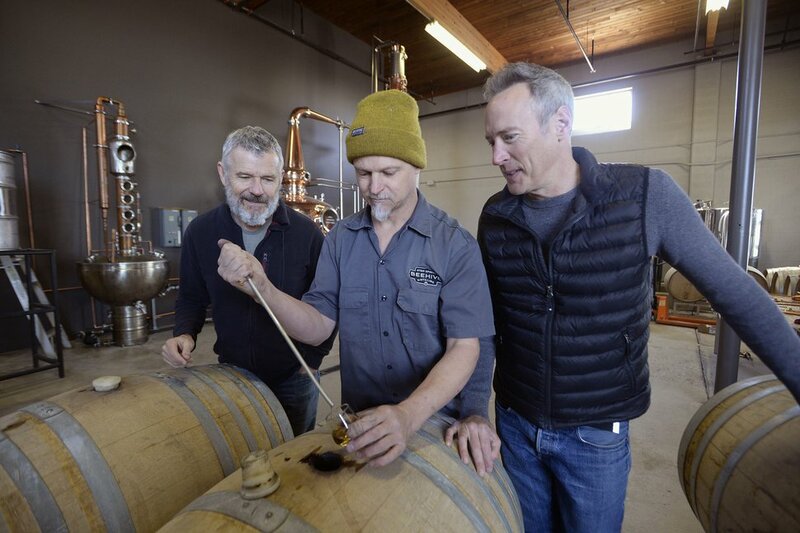 (Al Hartmann | The Salt Lake Tribune) Matt Aller, left, Chris Barlow, and Erik Ostling, co-owners of Beehive Distilling check on the Barrel Reserve Gin at their new Salt Lake City location at 2245 S. West Temple. The new 450-gallon copper still in the background will allow the team to increase production. (Al Hartmann | The Salt Lake Tribune) Salt Lake City's Beehive Distilling, known for its gin and vodka, has a new location at 2245 S. West Temple. (Al Hartmann | The Salt Lake Tribune) Beehive Distilling's Barrel Reserve Gin. 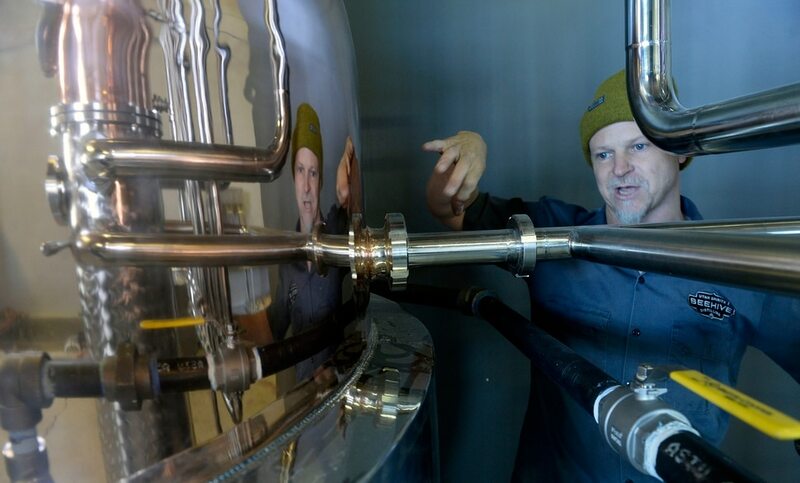 (Al Hartmann | The Salt Lake Tribune) Head distiller Chris Barlow gets the new 450-gallon copper still up and running at Beehive Distilling's new Salt Lake City location, 2245 S. West Temple. Beehive will continue to make its signature Jack Rabbit gin, but the larger still means it can start producing whiskey and other spirits. South Salt Lake • Bigger is better for Utah’s Beehive Distilling. The gin producer just moved into a 10,000-square-foot production facility at 2245 S. West Temple, where the showpiece is a shiny, new 450-gallon still. The new equipment will allow the distillery to start producing a variety of spirits including whiskey, rum and maybe brandy, said Matt Aller, a co-owner with Erik Ostling and Chris Barlow, who also is the head distiller. “We’ll be able to do everything now that we have the capacity,” Aller said. In making the move, the trio brought along the original 80-gallon still the business has used since 2013, when it opened in a small, nondescript warehouse in a Salt Lake City industrial park. The original now sits next to its larger sibling and will continue to produce Beehive’s popular Jack Rabbit Gin and Barrel Aged Gin, Barlow said. Beehive, next to the Utah Transit Authority TRAX line at 2100 South, is the fourth liquor manufacturer to call this South Salt Lake neighborhood home. It joins Shades of Pale Brewery, the soon-to-open SaltFire Brewery, and Sugar House Distillery. A soon-to-be-named brewery also is expected in 2019. (Al Hartmann | The Salt Lake Tribune) The new 450-gallon copper still at Beehive Distilling's new South Salt Lake location at 2245 S. West Temple. Beehive will continue to make its signature Jack Rabbit gin, but the larger still means it can start producing whiskey and other spirits. While production already has started at the new location, much of the space is still evolving. Eventually, it will include a tasting room and an open area to host events — two things the original location couldn’t provide. The retail store, where residents and tourists can buy Beehive spirits, should be ready to open Monday, April 16. Last year, the distillery sold more than 2,800 cases of gin and organic vodka, mostly in Utah, but also in Wyoming, Idaho and a few stores in Oregon and California. 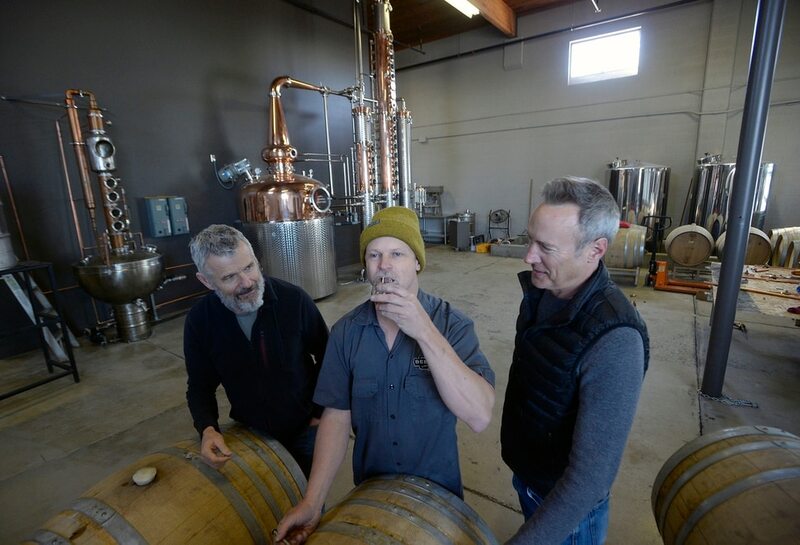 (Al Hartmann | The Salt Lake Tribune) Matt Aller, left, Chris Barlow, and Erik Ostling co-owners of Beehive Distilling, check on the Barrel Reserve Gin at their new Salt Lake City location at 2245 S. West Temple. The new 450-gallon copper still in the background will allow the team to increase production. Beehive’s recent growth is just another sign that Utah’s liquor manufacturing community is healthy and expanding. In 2012, the state had three distilleries — Ogden’s Own and High West Distillery, in Salt Lake City and Park City. Today, 16 licenses for the distilling of alcohol have been granted, according to the Utah Department of Alcoholic Beverage Control. Hammer Spring Distillery (Salt Lake City) • Owners JP and Victoria Bernier received a manufacturing license from the DABC in January and expect to open this spring. If all goes as planned, they will be the first distillery in Utah to produce a potato vodka, using spuds from Utah and Idaho. They also plan to produce gin, a straight rye whiskey and Perky Cowgirl Coffee Liqueur. Waterpocket Distillery (West Valley City) • Owners Julia and Alan Scott produce rum, but specialize in liqueurs. The distillery is named after the Waterpocket Fold, Capitol Reef National Park’s primary geological formation. Their Snow Angel Kummel is made with caraway, green anise, fennel, coriander and peppermint, while the botanical Oread contains a dozen herbs and flavorings including chamomile, galanga, star anise and orange peel. 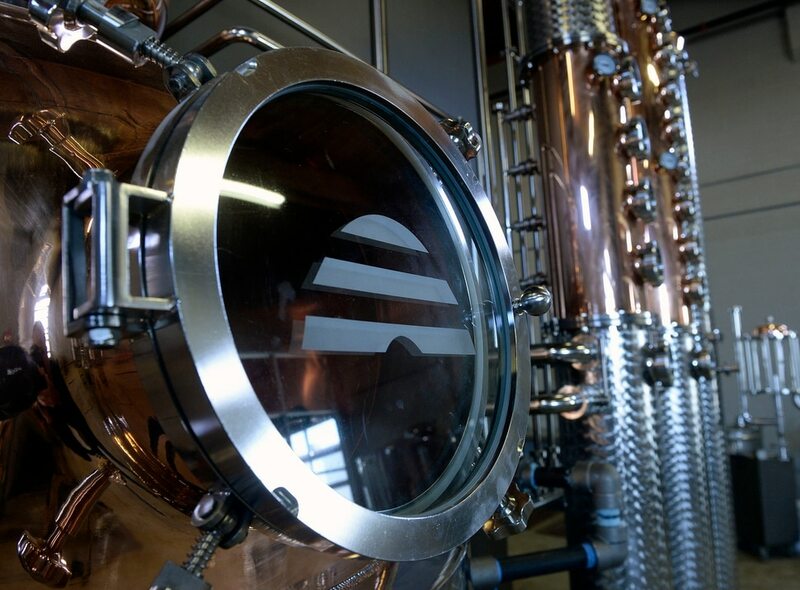 Alpine Distilling (Park City) • Specializing in American single malt whiskeys, Alpine also produces, rum, vodka and a liqueur made with black tea, blood oranges and ginger. Its signature whiskey is the 88-proof Traveler’s Rest, aged in used whiskey barrels and finished with new, toasted French oak. New World Distillery (Eden) • The only Utah manufacturer of an agave spirit, called Rabbit and Grass Blanco. Head distiller Chris Cross and his wife and co-owner, Ashley Cross, can’t call their products tequila, because that is a protected appellation of origin and can be used only to describe agave spirits distilled in the Tequila region of Mexico. Whether they are several years old or just starting out, most Utah distillers have taken advantage of liquor law changes made several years ago that allow them to offer tastings to customers. They also have on-site retail stores — called package agencies — where they can sell their liquor products to customers. Utah also gives small liquor producers an exemption on the state mark-up price, making the local products more affordable.